You would certainly know about ‘Intensive Care’ if you happened to be either an immunologist or a poet. Miroslav Holub was both. He collected a book of verses under this title in 1996. 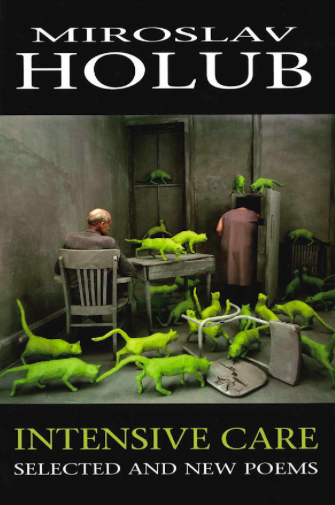 Holub’s poems were not published in his homeland of Czechoslovakia until the end of his career, long after English audiences first read translations of his work in the 1960s (and 30 languages followed). During World War Two, Prague was under German occupation and the Nazis closed all of the city’s universities. Holub was conscripted to the railways. After the War he completed his medical training, and worked in a psychiatric ward at Prague’s Charles University. Then came further suppression of his writing from the Communist Left, laying bare a shared Soviet and Nazi intolerance to whispers of irreverence. Holub’s dissent fell just short of cause for arrest. Albert Szent-Györgyi, who knew a thing or two about maps, By which life moves somewhere or other, Used to tell this story from the war, Through which history moves somewhere or other. From a small Hungarian unit in the Alps a young lieutenant Sent out a scouting party into the icy wastes. At once It began to snow, it snowed for two days and the party Did not return. The lieutenant was in distress: he had sent His men to their deaths. On the third day, however, the scouting party was back. Where had they been? How did they manage to find their way? Yes, the man explained, we certainly thought we were Lost and awaited our end. When suddenly one of our lot Found a map in his pocket. We felt reassured. We made a bivouac, waited for the snow to stop, and then with the map Found the right direction. And here we are. The lieutenant asked to see that remarkable map in order to Study it. It wasn’t a map of the Alps But the Pyrenees. The poem is a telling of a telling of a telling of a story. At the center of the story is a map. The map makes sense of a landscape, but the twist here is that the map doesn’t contour the immediate surroundings of the scouting party – the Alps – but rather a totally different mountain range – the Pyrenees. Nevertheless, in a moment of despair, this other map which should have been unfit for purpose, instills a form of cognitive discipline on the lost soldiers. The lineation and structure of Holub’s stanzas are working hard, showing how as readers we also seek guidance. The first stanza has clearly marked punctuation. Although the phrases “somewhere or other” and “a thing or two” are deliberately imprecise, commas and periods end the lines and divide the clauses to steer the sense. Controlling the movement of the lines is suggestive of how “life” and the onward march of “history” is retrospectively shaped into comprehensible plots, whether as maps for explorers or stories for researchers. But Holub takes away these grammatical footholds when the poem’s lieutenant sends his troops into the void. We lurch through the snow with the scouting party, unsure, looking beyond the line endings in the second stanza to find the assurance of a full stop. The lieutenant’s conclusion, flagged by two instances of terminal punctuation, is that the “icy wastes” must have brought his men to their “death”. But then, as surprising as the soldiers’ reappearance, a simple sentence is contained in a single line: “On the third day, however, the scouting party was back.” The spokesperson’s explanation of events on the slopes recalls their critical disorientation, replicated in the run-over line (“we certainly thought we were / Lost”). When the map is rediscovered “We felt reassured”. And so too is the reader. The shift in the use of “wait”, from a hopeless martyrdom (of “awaited” death), to pragmatic decisiveness (they “waited for the snow to stop”) suggests how even the wrong map refreshes the men’s outlook. They pitch a tent. They find faith that the weather will turn in their favor. “The right direction” is a mental state, which then becomes a physical reality. The poem’s message is clearer when you know that Albert Szent-Gyorgyi, named in the first line, was a real person. A Hungarian “scientist-turned-freedom-fighter-turned-covert-diplomat” (1893 – 1986), Szent-Gyorgyi received the 1937 Nobel Prize in Physiology and Medicine for his discovery of vitamin C. As Holub’s poem tells us, he “knew a thing or two about maps” from his research charting the human body’s biochemical mechanisms, as well as from his military experience in both of the World Wars. Expertise in two professions had awakened Szent-Gyorgyi’s excitement and cynicism in equal measure. 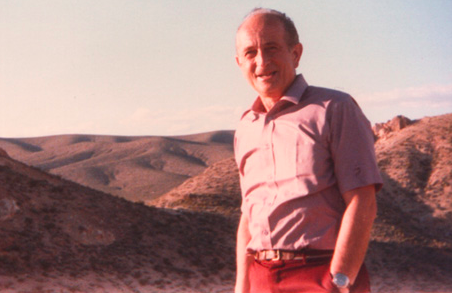 Holub might have been inspired to retell Szent-Gyorgyi’s anecdote about the Pyrenees map after he attended a lecture given by Oscar Hechter in 1972. We know that Holub was in the audience of Hechter’s talk at the International Conference on Cell Membrane Structure where, in the context of his pathology research, Hechter voiced his admiration for Szent-Gyorgyi’s scientific endeavors. As an aside, he relayed Szent-Gyorgyi’s mountain story. Hechter’s very wording, preserved in the transcription of his lecture, bears close resemblance to Holub’s poem. 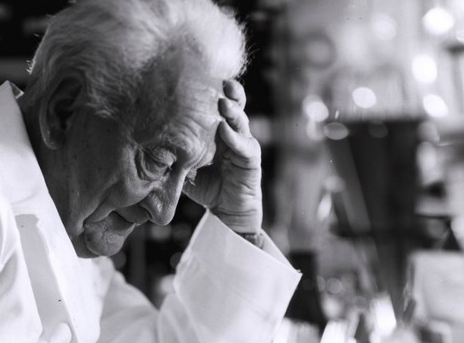 Albert Szent-Gyorgyi working at his lab bench, Woods Hole, Massachusetts (1965). Original Repository: National Library of Medicine. Prints and Photographs Collection. For both Szent-Gyorgyi and Miroslav Holub then, a map’s accuracy is only part of the picture: it should be first and foremost an instrument for stimulating resourceful, improvised thought. http://www.poetryfoundation.org/bio/miroslav-holub  http://www.nytimes.com/1998/07/22/arts/miroslav-holub-is-dead-at-74-czech-poet-and-immunologist.html  https://dogmatika.wordpress.com/2008/04/10/the-eurekist/ http://www.oberlin.edu/stupub/ocreview/archives/1998.09.04/arts/holub.html  Miroslav Holub, ‘Pathology’ (1967)  http://www.nytimes.com/1998/07/22/arts/miroslav-holub-is-dead-at-74-czech-poet-and-immunologist.html  Elmer Bendiner, ‘Past and Present: Albert Szent-Gyorgi: The Art of Being Wrong’, Hospital Practice May 1982, vol. 17 no. 5, p.191. Kate Womersley is an editor at REMEDIA. She has a master’s in History of Medicine from Harvard University where she was a Frank Knox Fellow, and is currently a graduate medical student at Cambridge University.